FARGO, N.D. — The RedHawks and Chicago Dogs put on a show for the 3401 fans at Newman Outdoor Field for the series finale Wednesday night. The two teams combined to clobber six home runs as the Dogs ran to a 9-8 victory despite a Fargo-Moorhead comeback bid in the ninth. Fargo-Moorhead added two runs in the fifth before scoring three in the sixth on back-to-back home runs from Chris Jacobs and Keury De La Cruz. Jacobs’ monster shot clanked off the video board beyond the fence before coming back onto the playing field. 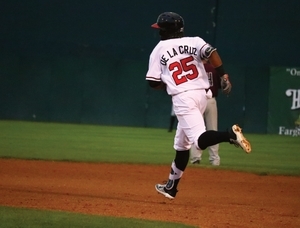 The Hawks narrowed the deficit to three runs heading into the ninth inning, and De La Cruz’s second homer of the night — a mammoth two-run blast onto Albrecht Boulevard — got the home team within one run of extra innings. In the end, Chicago pitcher Taylor Grover was able to induce a popout from Charlie Valerio to end the game and clinch a series win for the Dogs in their first trip to Newman Outdoor Field. Fargo-Moorhead falls to 42-33 for the year and remain one and a half game behind the Gary SouthShore RailCats in the North Division standings. The RailCats and St. Paul Saints — who trail the RedHawks by a half game in the standings — each lost tonight as well.